Museum of Kindness shortlisted for the 2018 Pat Lowther Memorial Award. Poem selected for The Best of the Best Canadian Poetry in English, Tenth Anniversary Edition, 2017. Poem selected for Best Canadian Poetry, 2015. Eds. Jacob McArthur Mooney, Anita Lahey, and Molly Peacock, 2015. Shortlisted in the PRISM International poetry competition, 2014. Judge Karen Solie. Longlisted in the Canada Writes: CBC Poetry Prize competition, 2014. Selected as an Editor’s Choice for the Arc Poem of the Year contest, 2013. Marge Piercy Juried Intensive Poetry Workshop, Wellfleet, MA, 2013. Poem selected for Best Canadian Poetry, 2008. Ed. Stephanie Bolster and Molly Peacock. Susan’s poem, “Box,” was selected by Canada’s Parliamentary Poet Laureate John Steffler as the 1st-place winner of Arc Poetry Magazine’s Poem of the Year contest. “Box” was published in The Best of Canadian Poetry in English, 2008 — the inaugural volume of an anthology guest-edited by Stephanie Bolster and published by Tightrope books, and in The Best of the Best Canadian Poetry in English, 2017. Montreal—Wednesday, November 22, 2007. 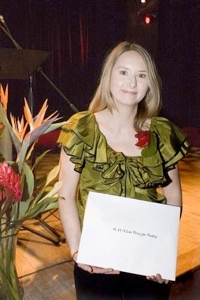 Susan Elmslie won the Quebec Writers’ Federation A.M. Klein Prize for Poetry for I, Nadja, and Other Poems. The other two nominees for the A.M. Klein Prize, sponsored by the family of Sidney Weisbord, were Jon Paul Fiorentino for his The Theory of the Loser Class and Lazar Sarna for He Claims He is the Direct Heir. I, Nadja, and Other Poems was also shorlisted for the McAuslan First Book Prize, along with Rawi Hage, for his novel DeNiro’s Game, and Melissa A. Thompson, for her novel Dreadful Paris. The prize is sponsored by McAuslan Brewing Inc. 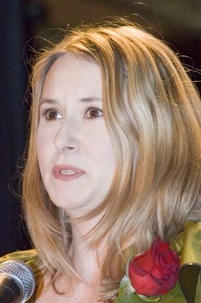 The Quebec Writers’ Federation Awards were presented at a gala ceremony at Le Lion d’Or. I, Nadja is a book in love with sound: rhythm, off-rhyme, rhyme. Elmslie’s poems are rich in texture, dense in imagery, dazzling in diction and direction. [Elmslie] writes directly, and elegantly, seemingly effortlessly. The beautiful lines come, but she never draws too much attention to them. So many writers save their best lines for the last line, but she has so many to spare she leaves them liberally all over the place. [This] is a richly imagined collection that covers an immense poetic, intellectual and psychological terrain. Filled with striking imagery and language that is no less poetic for being accessible, these poems are intensely readable. As a stylist, Elmslie is sharper than a paper cut—I suspect she edits her lines with new razors and breaks her stanzas with bone saws. Some of the loveliest, nastiest, most charming and most caustic poetry I’ve read in years. photos by Monique Dykstra, Studio Iris. I, Nadja is a fine book from cover to cover. The narrative poems offer plenty of “Equipment for Living,” from George Sand’s wardrobe to Marie Curie’s experiments. Elmslie’s work is exact, passionate and alluring; each lyric lingers long after the page has been turned. Elmslie gives us a glimpse of André Breton’s Nadja—surrealist sphinx as poet and desiring woman—and in doing so reveals her own depth and breadth as a poet. A powerful debut. The Pat Lowther Memorial Award is presented annually by the League of Canadian Poets to honour a new book by a Canadian woman poet. It is presented in honour of poet Pat Lowther, whose career was cut short in 1975 when she was killed by her husband. The other shortlisted titles and poets were: Inventory by Dionne Brand, Liar by Lynn Crosbie, Types of Canadian Women by K.I. Press, Lemon Hound by Sina Queyras, and The Good Bacteria by Sharon Thesen. Sina Queyras was presented with the award at the League’s Annual General Meeting in Edmonton, on June 9th, 2007. Congratulations, Sina! Visit the League’s website (www.poets.ca) for more information. The ReLit Award has been called “The country’s pre-eminent literary prize recognizing independent presses” (Globe & Mail). For more info about the award and to see the other shortlisted titles and poets, check out www.relitawards.com.